“Every really good disc golfer can ace almost every hole here, so we’ve made changes to make the course more technical and fun,” explained Chandler Guilbeault while standing on the tee of the eighth hole, his favorite basket at Evergreen Disc Golf Course. Originally from Cape Cod, Guilbeault started playing Frisbee in the early ’90s, when he used light poles in parking lots for baskets. 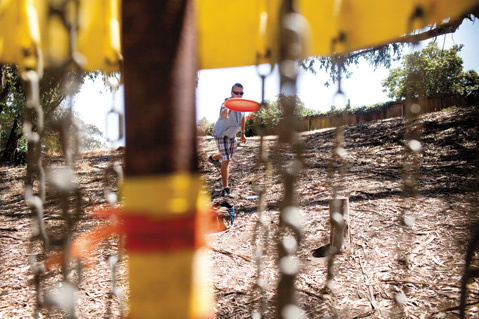 Today, Guilbeault, who’s got 48 aces under his own belt, helps maintain Goleta’s disc golf course, where he’s been involved since its earliest days. He’s built benches, tee boxes, and bridges with recycled materials that come from his day job at a hot tub store as well as moved and maintained baskets for a safer course with better flow. As one of the course’s “pros,” he also runs the annual Evergreen Open, which is on July 11-12 this year. See evergreendiscgolf.com.